NeighborWorks America is a non-profit organization that supports community development in the United States. The organization provides grants and technical assistance to more than 240 community developments and they provide training for housing and community development professionals through its national training institutes. 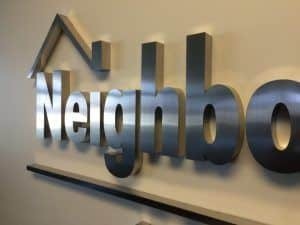 Their national headquarters is in Washington D.C. so when they opened an office in Los Angeles, they were looking for a local company for their signage. The Los Angeles office is located inside of Union Bank Plaza so they do not have a storefront. This is the case for many offices which is why lobby signs are so popular for businesses that are located inside of office buildings. 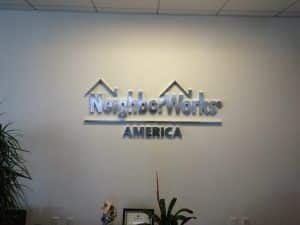 NeighborWorks America was very easy to work with because they already knew exactly what they wanted for their sign. 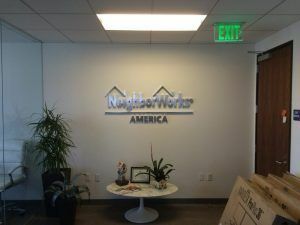 Other NeighborWorks America offices already had a lobby sign so they simply sent over the specifications for us to make them one for the Los Angeles office. Many times, businesses with multiple locations will already have specifications to provide from an existing sign. Whether each location is required to have the same design, or they just like the look of the existing sign, this can make things very easy for the sign company because all we need to do is scale the sign based on the space it’s going in. The sign we made for them is essentially a non-illuminated reverse channel letter sign. 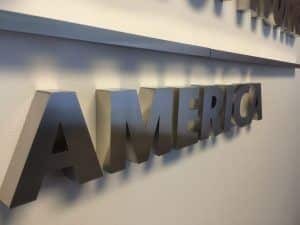 They asked for fabricated stainless steel letters with brushed faces and 1″ deep returns. The registered trademark logo is just a solid circle, and the “R” was painted. There are many cases when a trademark symbol needs to be included on a sign, but it’s so much smaller than the other components of the sign so we need to figure out the best way to fabricate it to make sure it matches with the rest of the sign.